At Seamark on First, we offer comfortable and modern 2 bedroom apartments with all the comforts of home. Your spacious Mooloolaba apartment is suitable for a family of up to 4 people, couples or friends sharing a wonderful holiday together. Our 2 bedroom Mooloolaba apartments are very popular with our regular guests and tend to fill up very fast, so booking early is always the best option. If you are unsure of whether you need a 2 or 3 bedroom apartment for your Mooloolaba family holiday, just contact us as we are always happy to chat about your needs. 1 x queen bed and 2 x single beds. An ensuite and a large family bathroom with shower over bath. A good sized, well equipped, kitchen with full sized refrigerator, dishwasher, microwave and laundry facilities. Furnished balcony suitable for lounging, reading or dining with family and friends. Our spacious, open plan Mooloolaba accommodation gives you the flexibility to spend your holiday participating in all the activities that you love, with the security of knowing that you can return to a well-appointed apartment that offers you all the comforts of home. At our Mooloolaba resort we want to make your holiday as enjoyable as we can, so don't hesitate to call us, regardless of your needs. 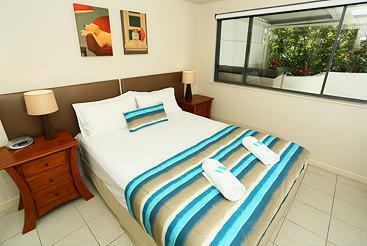 For an overview of our 2 bedroom apartment, watch our video. Each apartment is fully self-contained with a good sized kitchen and laundry facilities; one queen sized and 2 single beds, an ensuite and a family bathroom, and private furnished balcony so you can enjoy an alfresco meal and refreshing drink.We offer guaranteed "View Rooms" from the 8th level and above for additional cost. Enjoy a drink on your balcony whilst watching sunsets over the ocean or whales as they pass by! Our 3 bedroom apartments have 2 queen sized beds, 2 single beds, a good sized ensuite to the master and a family bathroom. 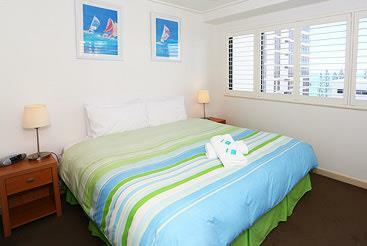 You have 2 private balconies, a fully equipped kitchen and laundry, dining and lounge area and good quality fittings. We offer guaranteed "View Rooms" from the 8th level and above for additional cost. 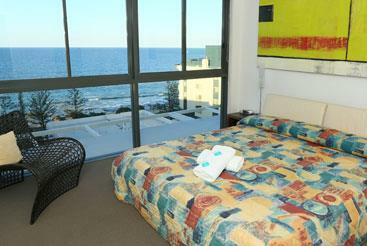 Enjoy a drink on your balcony whilst watching sunsets over the ocean or whales as they pass by!